Butcher, baker, candlestick maker best describes the baseball life of Grover Allen Hartley. He did it all. Baseball player, coach, manager, umpire, union organizer, business manager, owner, fireman – that was Grover Hartley. Loved, beloved, hated, and scorned - that was also Grover Hartley. Hartley was born July 2, 1888, on a farm near Splashville, Indiana, a small unincorporated town 65 miles southeast of Indianapolis and 65 miles west of Cincinnati. Raised on the farm, he had only two things on his mind, and education wasn’t one of them. Each Saturday after he finished his chores around the farm he would walk the three miles into nearby Osgood, Indiana, to watch the Osgood town team play baseball. Hartley soon became enamored with the game. While still in his early teenage years he vowed he would be a member of the Osgood town team or break a leg trying for it. By the age of 16 all thoughts of breaking his leg were gone. Instead, he became the shortstop for the Osgood team. Noted for his range and quickness at shortstop, Hartley was given the nickname “Slick” by his teammates. A town-team regular at 16, Hartley soon had wandering eyes – and feet. Each year he would go from town to town trying to find a local team that was better than the one he was playing for at the time. His wandering took him to Cedar Creek, Indiana, in 1907 and Versailles, Indiana, in 1908. Returning to the Osgood team in 1909, Hartley got the break of a lifetime when Osgood traveled to New Albany, Indiana, to play a much more experienced team. Hartley wowed the spectators with his dazzling play at shortstop and his disciplined hitting prowess. One of the spectators was Sam Ray, the owner of a professional team in Battle Creek, Michigan. Ray asked Grover if he wanted to play baseball for money. Hartley immediately knew if he wanted to play he would have find another position. Battle Creek needed a catcher. Grover Hartley became a catcher. Unfortunately, two weeks later he broke his finger. Broken finger in hand, Hartley went back to the farm, and when the finger healed rejoined the Osgood team; this time as a catcher. In 1909, Harry Hayes was Osgood’s best pitcher. After a game against the Chickasha Indian baseball team, Hayes left Osgood to pitch for the Indians. Pitch he did; win he didn’t. When, after several losses, Hayes was told he either had to win or he would be released, he said he could win if he had his old catcher. With a successful season catching for the Chickasha Indians under his belt, Hartley began a professional odyssey that would guide the rest of his life. Early in 1910 at the age of 21 he signed with Decatur of the Class D Northern Association. Shortly thereafter he was moved to Springfield of the Three I League where he was paid $125.00 a month, and, then to Toledo, Ohio, of the American Association where he was paid $200.00 a month. On May 13, 1911, 22-year-old Grover Hartley made his major-league debut. While much might have been expected, little was accomplished. Instead, Hartley’s playing time was limited to 59 games from 1911 through 1913. Though he only appeared in 23 games with 19 at-bats during the 1913 season, it was the off-season that made its mark on Grover Hartley. The amalgamation reached fruition on January 6, 1914, when a group of five baseball executives led by August Herrmann, Cincinnati Reds owner and Chairman of the National [Baseball] Commission, met with six representatives of the Baseball Players Fraternity. This was an important meeting between baseball labor and capital. At the same time baseball was facing the loss of several big name players to the upstart Federal League, the Fraternity was demanding changes that Baseball felt would cause great economic hardship. Grover Hartley was one of several players attending the meeting in support of the Fraternity and its representatives. It is not known whether Hartley’s attendance signaled strong union feelings, or if it simply signaled the fact that Osgood, his off-season home, was only 65 miles from Cincinnati, and easily accessible to the meeting. Five days after the trade that brought him to the Cincinnati Reds, Grover Hartley married Marie Vesta Wrede in a simple ceremony held in his hometown of Osgood. Life was great. Hartley could look forward to married life while playing baseball close to home. While his marriage grew stronger each day, the euphoria of joining the Cincinnati Reds soon started to crumble. Less than a week after the Cincinnati meeting, Hartley became embroiled in a confrontational letter exchange with Cincinnati Reds president Herrmann and with former teammate and new Cincinnati Reds manager Buck Herzog. Perhaps Herrmann was upset with the fact that Hartley had attended the January 6th meeting in Cincinnati. Perhaps Buck Herzog changed his mind on Hartley’s catching ability. Regardless of the motivation, Hartley was offended when he was offered a contract with an annual salary of $2250.00 and a “side agreement” for $750.00. Hartley returned the contract unsigned. He felt he deserved a minimum of $4000.00 for the 1914 season. He tried to explain to Herrmann that he could accept a lower salary in New York because there were several opportunities to make extra money in New York. Additionally, Hartley felt his three years of serving as a backup catcher under the tutelage of John McGraw made his value to the Cincinnati Reds worth more money. As a result, instead of being a backup catcher for the Cincinnati Reds, Hartley became the primary catcher for the Federal League’s St. Louis Terriers. Playing in a total of 206 games during the short two-year history of the Federal League, including 120 games in 1915, Hartley ranked in the top 25 in doubles (21) in 1914 and the top 25 in RBIs (50) in 1915. On December 22, 1915, the Federal League, in an agreement with Major League Baseball, agreed to cease operations. In return, Major League Baseball agreed to pay $600,000 for distribution to Federal League owners as well as agreeing to allow the amalgamation of two Federal franchises. In addition, all Federal League players were declared eligible for the major leagues with an agreement that National and American League teams could bid for them in a Federal League-controlled auction. With agreement in hand, St. Louis Terriers owner Phillip de Catesby Ball was awarded the American League’s St. Louis Browns franchise. Shortly thereafter, the St. Louis Browns purchased the contracts of 11 former St. Louis Terriers, including that of Grover Hartley. The move to the Browns quickly resulted in a return to being a backup catcher. After appearing in only 19 games in 1917, Hartley was demoted to the Columbus Senators of the American Association where he served as both catcher and manager. On January 13, 1920, when Bill Clymer was hired to manage Columbus for the 1920 season, Hartley asked Joe Tinker to trade him. Two weeks later both the New York Times and the Atlanta Constitution reported: “The St Louis Nationals (Cardinals) tonight announced the purchase of Manager Grover Hartley, a catcher of the Columbus Club of the American Association.” According to Baseball Library.com, one week later the Cardinals included Hartley in a trade with the Los Angeles Angels of the Pacific Coast League for first baseman Jack Fournier. Neither of these transactions appears on official Grover Hartley transition pages, nor does he appear on the 1920 roster for the Los Angeles Angels. Instead, records show he continued to play and catch for the Columbus Senators where he led the league in batting average (.376) as late as July 25. Hartley, despite a holdout in 1922 that required intervention from Columbus President Burns, continued to play for the Senators until his contract was sold to the New York Giants on September 6, 1924. The demotion, while devastating at the time, soon resulted in a promotion, a trivia answer, and a lawsuit. The promotion came at the end of the 1926 season when Hartley was drafted by the Boston Red Sox where he appeared in 103 games during the 1927 season. The trivia answer came when the 103 games he played in 1927 combined with the 117 games he played for the 1915 St Louis Terriers gives him the major league record for the longest time between a player’s 100-game seasons without appearing in 100 games during any season in between. While this record is fact, it is discounted by some baseball purists who do not recognize the Federal League as a major league. Surprisingly, after Hartley’s appearing in 103 games in 1927, the Red Sox released the 39-year-old catcher on waivers to the Cleveland Indians, who selected him to coach, not to catch. The Georgia Railroad lawsuit was just the beginning of an eventful 1928. The 1928 season marked Hartley’s 40th birthday as well as the first of ten years as a coach in the major leagues. He decided to celebrate his 40th birthday by taking four friends to dinner. Always looking for ways to make more money, or lacking that, save money, he negotiated a trade with the manager of the restaurant. For five chicken dinners, he signed a baseball on which he noted every team he had played for from 1906 to 1928 including home-town teams, minor-league teams, and major-league teams along with the July 2, 1928 date. A year later, at the age of 41 and still a coach for the Indians, Hartley appeared in 24 games as a catcher. The next year, 1930, still coaching for the Indians, he appeared in one game – a game in which he had three hits in four at-bats for a .750 batting average for the year. In addition, minor-league records show he also played in six games for Louisville of the American Association that year. When and how Hartley was available to play for Louisville is unknown. Following the 1930 season, the Pittsburgh Pirates hired him as a coach for the 1931 season. Though Hartley did not play for the Pirates during his three year tenure as one of their coaches, he was indirectly involved in a June, 1933, game when the Chicago Cubs successfully pulled off the hidden ball trick against the Pirates. The Chicago Daily Tribune’s report of the game mentioned that Hartley was the Pirates coach when the Cubs pulled off the trick. The Tribune noted both the runner and the coach were fooled. 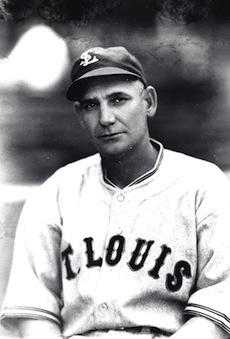 After three years with the Pirates, Hartley moved on to coach for the St. Louis Browns. Hartley’s tenure with the Browns, due to unforeseen circumstances, cemented his place in baseball history. Not only was he the oldest player in the major leagues in 1934, he became the last active Federal League veteran when he appeared in the first of five games he played for the Browns that year. In addition, he became the oldest position player in major-league history to start a game – a record that he held until 2004 when 46 year-old Julio Franco started a game at first base for the Atlanta Braves. Franco eclipsed the record in 2005. Grover Hartley appeared as a player in a major-league game for the last time on September 30, 1934. After appearing in five games as an emergency catcher for the 1934 Browns, Hartley stepped up to a different emergency in 1935. On July 29, in a game scheduled between the Browns and the Chicago White Sox, Hartley took the field as an emergency umpire replacement where he joined future Hall of Fame umpire Jocko Conlan and long-time American League umpire Harry Geisel. The game, won by the White Sox 7–2, was highlighted by a triple play made by the Browns. The following season was Hartley’s last as coach of the St. Louis Browns. When he left the Browns to become owner/manager of a minor league team in Findlay, Ohio, he left only two Federal League veterans in major league uniforms – Bill McKechnie, manager of the Boston Bees and Lena Blackburne, coach of the Philadelphia Athletics. Later, Hartley would become the last Federal League veteran to appear in a major league-uniform when he returned for one year to coach for the 1946 New York Giants. Hartley’s venture into minor-league management and ownership was met with limited success and a bit of controversy. Playing in the struggling Ohio State League (Class D), Hartley’s Findlay Browns were associated with the Baltimore Orioles for the 1937 and 1938 seasons. In 1939 the Findlay Browns became the Findlay Oilers after losing the Baltimore affiliation. The 1940 season featured small crowds for the Oilers and left a frustrated and financially stressed Grover Hartley. In February of 1941, Hartley told the Ohio State League that unless he found someone to buy his interest in the Findlay Oilers; he would move the franchise to Marion, Ohio. The League did not address the issue during their February meetings. Apparently, Hartley was not able to sell – or move – the “Oilers” before the 1941 season began. With the team name changed back to the “Browns,” Findlay continued to play in the Ohio State League. As a result of World War II, the Ohio State League suspended operations for the 1942 season. With the suspension of the Ohio State League, Hartley shut down all operations of the Findlay Browns’ baseball team and moved on to manage the 1942 Logan Indians of the Mountain State League. Although Baseball Reference.com indicates Hartley managed throughout the 1942 season, the June 18, 1942 Sporting News reported that Hartley had resigned as Logan’s manager. After leaving Logan, Hartley returned to his home in Columbus, Ohio where he took a break from baseball and worked for the city recreation department the balance of 1942 and all of 1943. After two years, the Ohio State League resumed operations in 1944. One of the teams to join the rejuvenated league was the Chicago Cubs affiliated Marion Diggers. The team name was changed to the Marion Cardinals in 1945 when it became affiliated with the St. Louis Cardinals. It is not clear if the Marion team was an outgrowth of the Findlay Browns as threatened by Hartley in 1941 or if the Marion team was simply a new team. Whichever the case, Hartley became the manager of the Marion Diggers for the 1944 season. Hartley started the 1945 season as manager of the newly named Marion Cardinals. Whether pressured by the St. Louis Cardinals, or simply frustrated with the progress of the Marion Cardinals, Hartley resigned during the first week of June. He was replaced as manager by Wally Schang who was replaced later in the season by Clifton Marr. Even though his last two manager jobs ended with mid-season resignations, the New York Giants called on him to serve as bullpen coach for manager Mel Ott for the 1946 baseball season. When the 1946 season ended, so did the major league career of Grover Hartley. With retirement in mind, Hartley and his wife Marie moved from their Columbus, Ohio, home to Daytona Beach, Florida. Retirement didn’t last long however. Instead, Hartley signed on as both field manager and business manager for the 1947 Daytona Beach Islanders of the Florida State League. Former New York Giant teammate Fred Merkle served as Hartley’s coach. After the 1948 Islanders’ season, Hartley moved back to Ohio where he became a business partner as well as both field manager and business manager of the Lima Chiefs. One vivid off-field memory of Hartley occurred while he was driving the Blue Goose – the name given to the team bus. One of the players dropped a lighted cigarette down the air vent. Shortly after, smoke started coming from the vent. Hartley, who was also the bus driver, stopped the bus, dropped his pants and pissed down the window-well to put out the fire. The contentious relationship continued during the off-season. In a December 12, 1949, letter to Mr. George M. Trautman, President of the National Association, Hartley complained that J. Ramon Laibe owed him a significant amount of money which Laibe refused to pay. After the close of the 1949 season,Laibe’s auditor showed a loss of $1474.99 which did not include the $1300 which is in your office,In other words we were $174.99 behind. Then we had two exhibition games with Sachel Payge’s Club with about 2800 attendance at $1.00 each, And were to get 35% of same,Now Mr Laibe contends that we owe over $3000.Due to the arrival of some unpaid bills. May I ask that you hold the $1300.until we arrive at decision,and dissolve the Partnership. With his partnership with Laibe dissolved and his claim for money due to him still open, Hartley moved back to his home in Daytona Beach. Again, his love for baseball took hold and he agreed to serve as a coach for the 1950 Fitzgerald Pioneers of the Georgia State League. Ever the wanderer, Hartley soon left Fitzgerald to return to his Daytona Beach home where he lived until his death on October 19, 1964. Grover Hartley was cremated with the cremains buried at the Greenwood Cemetery in Daytona Beach. Grover Hartley will be remembered for being one of the first major-league baseball players to participate in labor talks between players and management and as one of the first players to jump from the established major leagues to the upstart Federal League. He will be remembered as a slick fielding catcher who knew and loved his baseball – as a player, a coach, a manager, and as an owner. Always respected – sometimes contentious, Hartley was always his own man. He always stood behind, and lived with, his beliefs. Butcher, baker, candlestick maker - he did it all. Baseball player, coach, manager, umpire, labor activist, business manager, owner, fireman – That was Grover Hartley. Loved, beloved, hated, and scorned - that was also Grover Hartley. Most of all, Grover Hartley lived and breathed baseball. In fact, Grover Hartley was baseball. Los Angeles Times, January 19, 1911. Baseball Magazine, May, 1913, 71. Baseball Magazine, March, 1914, 33-38. New York Times, December 13, 1913. Hartley Letters (Hall of Fame archives). New York Times, March 7, 1925. New York Times, March 26, 1926. Atlanta Constitution, April 6, 1928. Los Angeles Times, August 24, 1934. Hartley letter from author’s collection. New York Times, March 26, 1946. Osgood Record, October 23, 1990. The Sporting News, April 14, 1948, 25. Interview: April 8, 2005: Joe Guagenti, John Mulcahy, Mike Lackey. The entire letter is presented with its original spellings. (author’s collection).